Select size and number of stars below. When my brother Lowell (pictured below on Monkey Mountain near Da Nang) shipped-out to Viet Nam, we were proud to display the Blue Star Service Flag at our home. 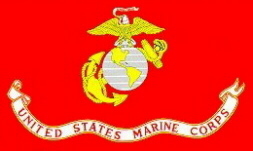 Display this Flag in the window of your home to honor family members serving in the Armed Forces. These banners are fully sewn reading correct on one side and complete with gold fringed bottom, wood dowel with spear ends and gold hanging cord. Stars are blue and borders are red. For one family member in the Service select 1 star flag, two family members the 2 star, etc. 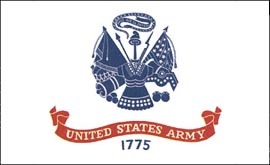 Flag of the U.S. Army, outdoor nylon. Outdoor Nylon Flag of the U.S. Navy. Merchant Marine Flag , outdoor nylon. 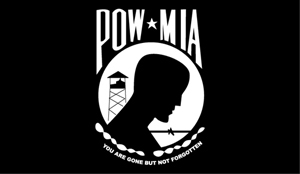 This POW/MIA Flag, the only flag displayed in the United States Capitol Rotunda, stands as a powerful symbol of our national commitment to our POW/MIAs until the fullest possible accounting for Americans still missing in Southeast Asia has been achieved. Choose size and Single Faced (SF) or Double Faced (DF) here.